It is never mentioned that Darwin was an extremely religious Christian and believed in the supernatural . He was not defying God , but trying to understand God's methods. And , I think he succeded(sp) in doing that . Darwin was concerned with CHANGE ; not Creation. 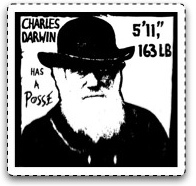 As with Christianity , it was Darwin's followers who misunderstood - - or deliberately mis-stated his claims . Darwin had no idea OF a 'GENOME' and made no claim of such . To Darwin , I propose that he would have considered it Divine . He was also a theologian. Though he did come to the idea that complexity can emerge from a natural process without the involvement of intelligence, which relegated God to the sidelines as far as science was concerned.